On the first day of Recode’s Code Media event in Huntington Beach, California, the head of news partnerships at Facebook, Campbell Brown, announced that the company has resolved a dispute with Apple about how publishers can implement paywalls in order to generate subscription revenues. According to Brown, “We’re working now on a subscription product that we’re moving forward with on iOS on March 1st, which is a breakthrough”. The company also said that it was adding a news section to Facebook Watch at the expense of News Feed. 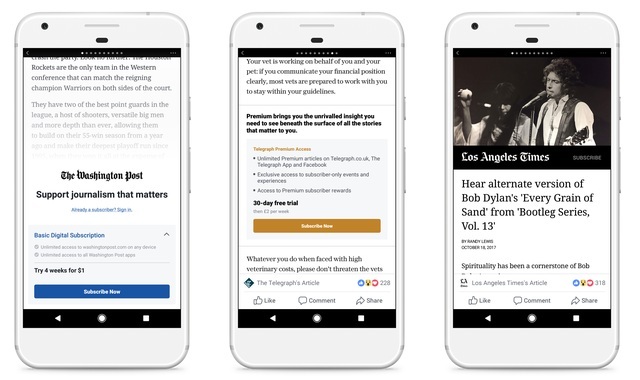 While Facebook started testing the subscription tool late last year for Instant Articles on Android, it hit a roadblock on iOS when Apple demanded that it be paid 30 percent of any revenue brought in through the service on Facebook’s iOS app. Facebook disagreed, arguing that the entire revenue should go to the publisher alone. It’s worth noting here that Facebook itself isn’t charging any commission from the publishers at the moment either, although, it’s not entirely clear as to how long this arrangement will last. Another point of contention between Apple and Facebook was the number of free articles users are allowed to access per month. While Apple insisted that users should have access to a bare minimum of 10 free articles before the paywall kicked in, the publishers demanded that the limit be lowered to five. Facebook supported the publishers to the hilt, and seemingly won out on that front as well, as the company is now expected to allow publishers to switch to the lower number. The change will start rolling out from March 1. As mentioned already, the feature has been available on Android since last October, which doesn’t have the same type of restrictions on how subscriptions can be sold although, Google also charges a 30 percent commission on every subscription sold by Android apps.